WineCompass: Where in the World is Slovenia? Where in the World is Slovenia? I've always had a fascination for Slovenia, not sure why, maybe i ts history of being swallowed by various empires - Austria to the north, Italy to the west, and of course, the old Yugoslavia. This attraction lead us to visit Ljubljanica and Lake Bled, taste some local beer and wine, and enjoy the country. However, the wine never really registered until we sampled them again at the Washington D.C. International Wine & Food Festival and then a week ago at a special trade tasting held at the Slovenian Embassy. The truth is that they are crafting excellent wines in this hidden region. Slovenian vineyards are primarily situated in two regions, the Podravje Region (Stajerska Slovenia) in the northeast and the Primorska Region (Brda-Collio and Vipava) in the southwest. The Podravje Region is the largest "appellation" and is more mountainous with plenty of southern exposure for the vineyards. The gravel and clay soils drain well and the hot summers and cool evenings provide an ideal climate for Sauvignon Blanc, Pinot Grigio, Traminer, Yellow Muscat, Pinot Noir, Zweigelt and Blaufränkisch. In fact this region is the source of German Lemberger. On the other hand, the Primorska Region borders Italy and consists of gently rolling hills and a micro-climate produced by the Adriatic Sea. Traditional Bordeaux and indigenous varieties are planted here - both made in the earthy European style. The Slovenian white wines were extremely impressive. We first re-tasted the Pullus Sauvignon Blanc and Pullus Pinot Grigio, which attracted our attention (and others) at the D.C. festival. These wines are crafted by the oldest winery in Slovenia, Ptujska Klet and are flavorful with balanced acidity - very nice everyday wines. 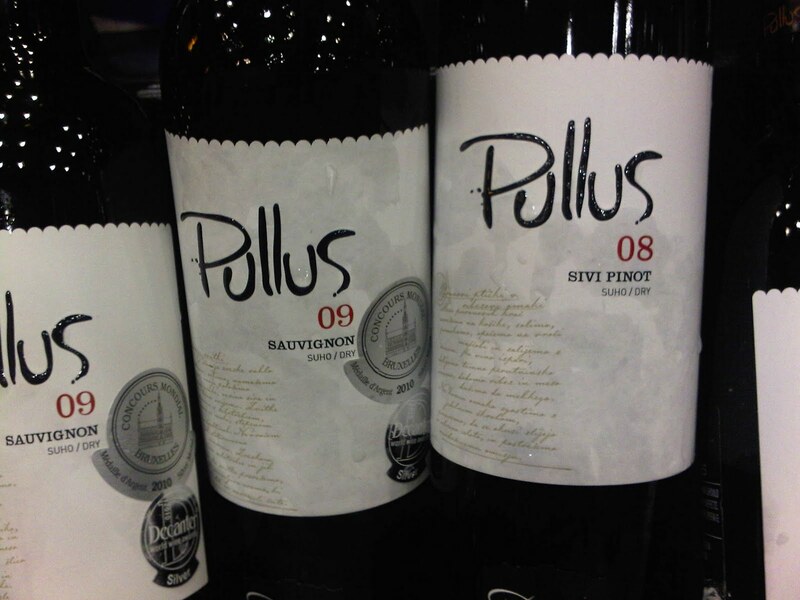 The winery also offers a Pullus G collection crafted for the restaurant market that are fuller from extended lees aging and partial malolatic fermentation. 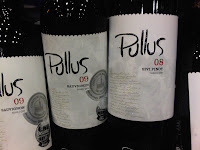 Besides the Sauvignon Blanc, the Pullus G Traminer was very good. Another excellent white wine from Stajerska was the Sanctum Chardonnay. This is the low alcohol Burgundy style - not the California fruit bombs. It is barrel fermented and aged on lees, but doesn't retain much oakiness since its aged in steel. Our type of Chardonnay. Yet, the most interesting white wine was the Mansas Klarnica, an indigenous grape grown on only 15 acres in the Vipava Valley. This rare treat is supposedly off-dry, but is much drier on the palette. Very interesting. There were several good red wines, although they seemed to be over shadowed by the white selections. Pullus and Sanctum both had very drinkable Pinot Noirs - nice and gentle. The Bordeaux blend Klinec Quela bio-dynamic wine was easily the most noticeable - red fruit flavors, strong tannins, and a long tail. We highly recommend researching and sampling Slovenian wines. They are both affordable and delicious. To find these wines in your area check out Fine Croatian Wines and Vinum USA.